Hello friends! It’s been a little while since our last update. I offer my apologies, and a bit of an explanation. On Sunday, my Surface charger fried (literally, the wire inside snapped and burned through the casing), leaving me unable to draw for a few days until we got a replacement. On Monday, I was let go from my job, for financial and not performance reasons (and I was one among seven). Now, don’t worry about me. I’ll be fine, and I already have a few leads on new opportunities. The comic should actually be more reliable than ever for a while. But in the worst case, I may need to offer commissions if I hope to retain any spending money for myself or advertising budget for the comic. It’s always been the case that donations you guys make here go directly to site and advertising expenses, and that won’t change. Anyway, I just felt you guys should know. I’d love to live off of art alone someday, but I don’t feel quite ready for that yet…! In better news, Victor fixed a problem with the fanart page in addition to my updates to the avatar and wallpaper pages recently. It’s a great time to check out “extras” if you haven’t in a while! Almost like the flute from Super Mario Bros. 3, one of the best game in existence. 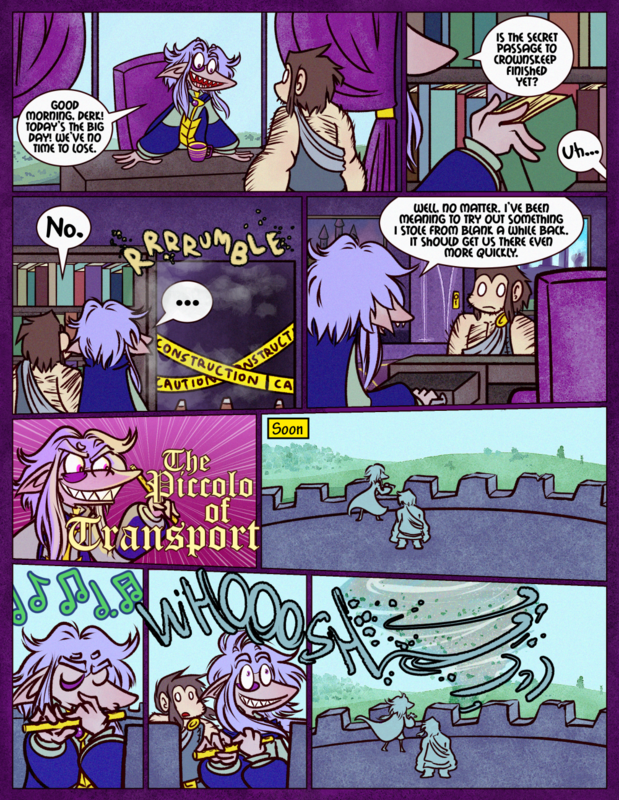 I laughed harder than I should have at the “PICCOLO OF TRANSPORT”. Why is that so funny?! Piccolos aren’t so funny when you’re up close to one. Or five. Trust a band kid. I’m surprised it took that long for a Piccolo joke to come up. But can he summon Latias/Latios with it? Or change the wind’s direction? CAN HE PLAY HOT CROSSED BUNS? He can do all these things and more, he just needs to learn the right songs. Aww, thanks! I’ll be sure to contact you if it comes to that. How the heck does he play that thing with shark lips? Yes, sheer determination. I can’t even play the flute/piccolo, or whistle for that matter, with human lips. That’s why it’s saxophone for me: if you can bite your bottom lip, you can play the sax. …actually Skarvs might want to avoid the sax, then. Biting himself just sounds like a bad idea. Derk: Uh, Boss? What if that tornado destroys the castle? Hope they’re not traveling on full stomachs. Should’ve nabbed two of them so he can skip straight to World 8…or, in Skarva’s case, World 1. Skärva is just so darn pleased! It’s so great to see him happy.